A cooling mattress protector is a welcome, energy efficient edition to any home. Besides saving energy, it also adds plushness to beds and improves people’s sleeping experiences. Many people shy away from making the initial investment, but getting a cooling mattress topper could significantly enhance the comfort levels of your existing mattress. A cooling mattress topper, or pad is a thin layer which covers the top surface of a mattress and has elastic edges like a fitted sheet. One of the main objectives of the pad is to protect the mattress, it adds a layer of cushioning to the surface thereby enhancing the softness, comfort and support. Toppers can either be found on the upper layer of a mattress (synonymous with comfort layer) while others can come beneath the top sheet. Pads and toppers are available in sizes that are compatible with standard mattress sizes. Additionally, they can also be used to create a dual-firmness surface as well. These mattress toppers are designed with the user’s comfort in mind. The key feature of a cooling topper is that moderates body temperature throughout the night, preventing excess sweating. It is particularly beneficial for warm sleepers. Check out our complete guide about the best memory foam mattress toppers. Comfort: Comfort with a mattress pad is subjective. It needs to be supportive without being too rigid. Simultaneously it needs to be plush but not too soft. The perfect fit: Mattress toppers work best with standard sizes. 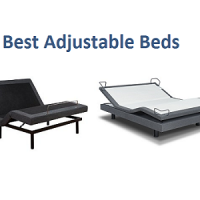 While toppers are meant to stretch around beds of different sizes, not all of them are able to and those that are lose their elasticity which in turn reduces their usability. Easy storage and protection: Pads that are heavy can be a major problem when lugging from one room to another. When buying a pad, make sure you test how easy it is to move from one room to another. Other than that ask some important questions in terms of storage and packing, whether it requires special care and whether it can be washed easily with your current equipment. Active Cooling Pads and Toppers: Active cooling pads come with attachable fans and water pumps which ensure that the sleeper remains comfortable. These can be customized and the users can choose a temperature of their choice. They can alternatively also warm up the surface during winters. Natural latex – this is extracted and processed from the sap of rubber trees. 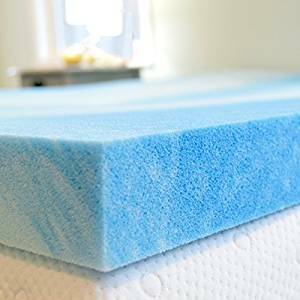 Gel-infused memory foam (also known as viscoelastic polyfoam), a polyurethane-based material that has chemicals added to it to enhance the softness and make it respond to temperatures. This is then filled with cooling beads or swirls. 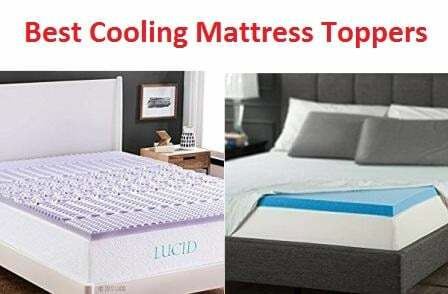 No matter what material is used to make a cooling topper, they are used making materials that make a sleeper feel cool. It also includes cotton, rayon, and/or bamboo fabric. Certain types also use phase-changing materials such as PCM which absorbs body heat and then stops retaining it, thereby creating a steady and even temperature throughout the night. An interesting note is that some brands need to be put in the freezer prior to use. Some can retain the cold for a lengthier period of time but in order to retain the coldness they need to be refrigerated. These are rare compared to active and passing cooling toppers. 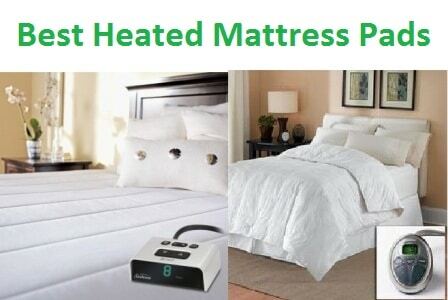 Keeps you cool throughout the night: These mattress toppers are designed in order to spread your body heat evenly and improve the air circulation underneath your body. With traditional mattresses, your body heat builds up and is then reflected back. This is what causes the heat and sweatiness. The purpose of a standard bed is to build comfort and stability, instead of focusing on ventilation. A mattress topper is designed for the unique purpose of heat diffusion and increased ventilation which will in turn create a great night’s rest because your body temperature will drop to a natural level. You won’t even need to sleep with the air conditioner or fan on. Reduced electricity bills. Which brings us to our next point. The air is circulated around the body because of which heat is taken away from the body which leaves you feeling much cooler. This means that your use of electricity reduces because of limited fan/air conditioner use. And even if you do use it you can now switch to a more energy efficient mode so that they aren’t under as much stress as before. The best part is that by choosing a mattress topper, you reduce your electricity bill as well as your carbon footprint, and all of this is possible by spending frugally and not cutting back on necessary luxuries. Economical choice: If your mattress isn’t as comfortable as you like, one choice is to replace it but the other more financially practical choice is to get a mattress topper. By buying a mattress, you are also wasting resources environmentally. By buying a mattress topper you are changing your sleeping experience. A topper adds another layer which enhances your sleeping experience as it improves temperature control as well as creates extra cushioning which provides the user with a restful night of sleep. Best part is, that it is also reasonably priced, making it a more feasible option than buying a new bed altogether. Alleviates pressure points: In case you are the kind of sleeper who tosses and turns often at night, you are probably prone to different types of back pain. If these are left untreated they can become chronic. If your mattress isn’t correct for you then it is possible that it is increasing pressure on a particular part of your body. What you should do instead is add a comfortable pad which serves as a barrier through its extra padded surface. No matter where the pad is located, the cool mattress topper will ease you from a night of restlessness no matter what position you sleep in. Softness: It adds an additional layer of cushioning and plushness which makes the experience very comfortable while alleviating pain points. Reduced elasticity: Cooling mattress toppers are kept intact using an elastic skirt. This elastic skirt, upon excessive usage can be loosened over time which in turn makes the topper move. Limited sizes: Mattress toppers only come in standard sizes and those who have beds with untraditional sizes will have trouble locating mattress toppers that will fit their beds. Excessive marketing: Sometimes manufacturers commit to more than they can deliver i.e. insisting that the mattress topper has certain qualities when it hasn’t even been designed such. This can lead to irate customers who begin to mistrust the product. The Sleep Innovation is the King mattress topper is a four inch pillow top mattress which works perfectly for side, back or stomach sleepers. Its dual layer can be washed with a machine and both layers can be held perfectly to create dream like comfort. The cooling gel memory foam contours according to the user’s shape; everyone needs comfort designed to their needs. It is designed by combining two inches of quilted fiber along with two inches of memory foam in order to create gentle support which alleviates excess pressure. It is manufactured in USA, packed and comes with a ten year limited warranty. A range of choices are available as the manufacturers don’t believe in a one size fits all approach. The product reacts to your body and its needs and adapts due to its innovative foam bedding. The manufacturers have research sleep, physical shapes, and people for twenty years in order to create a product of top notch quality where every element is tested for the best sleep possible. The cover is easy to move and can be washed safely in the dryer. Instead of buying a new mattress, you can create a luxurious experience within an affordable range. The giber fill comfort layer is similar to sleeping on a large soft pillow. It attaches to the bottom of the two inch gel memory foam and keeps it intact. The mattress topper is also known for its cooling properties and helps keeps temperatures regulated to provide a soft, restless sleep. This mattress topper is ideal for people who have back pain as well as those who feel the heat more than others. The memory foam is especially built to adapt to your spine’s natural curvature and can also reuse an old lumpy mattress and make it feel as good as new. The only time it won’t work for your needs is if you want it to make your mattress firmer; the foam is designed to make it softer. The fiberfill layer is comfortable. It is quick to bounce back. It is relatively pricey compared to other toppers. There is a slight odor if used immediately. It could be considered too soft for some of its users. The Viscosoft is a memory foam built to last. 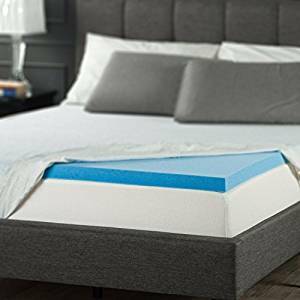 It has three inches of 3.5 inch high density gel memory foam which creates a top quality topper that alleviates pressure points and provides protection throughout the night. The heavier the foam is, the longer its durability. 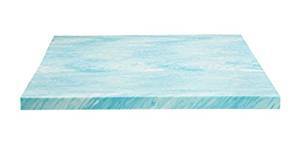 Not only is this foam long lasting it is also a socially conscious topper, free of ozone depleters, PCDEs, TDCPP and TCEP flame retardants, mercury, formaldehyde and has low VOC emissions which improves the quality of air indoors. Users must allow at least 24-48 hours for the memory foam to lose its smell as well as expand to shape. The ventilated design is made to improve the airflow by creating a more restful sleeping environment. The memory foam is made of plush gel material which traps heat and controls temperature. The plush baboo-rayon cover is made of 70% bamboo rayon and 30% polyester; the combination provides the topper with a soft, breathable exterior and the bottom of the cover consists of slip-resistant mesh as well as elastic straps that are adjustable on both side which can stretch to secure each corner of the mattress up to 16”. The cover is hypoallergenic and can be removed and washed in a machine easily. The best part about the Viscosoft is their sixty day superior guarantee. A USA based brand, they are committed to providing top notch products catered to improve their users lives. In case the mattress topper doesn’t match the users expectations they are given a 60 day guarantee post purchase where they are fully refunded. In addition, it also comes with a 3 year warranty against manufacturing defects. Any traditional mattress has a lifespan of approximately ten years after which the mattress begins to lose shape. The gel infused memory topper prevents that without having to pay a steep price. The innovative temperature controlled surface balanced the heat and leads to a quiet night’s rest. There is no odor upon unpacking. Within eight hours, the foam had reached its full expanded size. The mattress straps and cover help the foam stay intact. The temperature control distributes heat easily. It is difficult to get in or get out of the gel foam. It is squishy and you require a thick mattress in order for it to grab through the sheets. The Exceptional Sheets Bamboo Mattress is available as a Queen Mattress Pad (dimensions: 60” x 80”). It is designed to reinvigorate your sleeping experience and can fit a mattress up to 18” deep. It has been tested and certified as safe by the Consumer Product Safety Commission as the mattress does not use any flame retardant chemicals. It is made from plush rayon and filled with hypoallergenic and alternative RevoLoft Cluster Fiber. It is made of 30% cotton and 70% polyester. The skirt comprises of 76% polyester, 16% nylon and 8% spandex. The removable pillow top mattress provides unique comfort and support due to its soft, breathable material. Each pad is made with Revoloft, which is a high quality fiberfill made from authentic goose and duck down without feathers or any allergies. It protects your sleep, quietly and is compatible with mattresses that use innerspring, latex or memory foam. 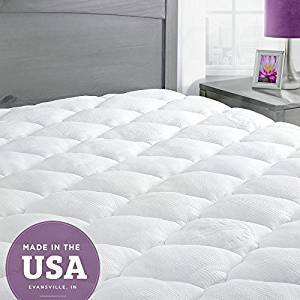 It is 100% hypoallergenic and has one hundred and sixty thread count covers with double needle baffle box stitch to prevent the fill from becoming displaced. The manufacturer has sold over a million mattress pads and provide a money back guarantee in case users are unsatisfied with their experience. The top quilted bamboo blend is silky and extra plush to ensure a comfortable sleep. 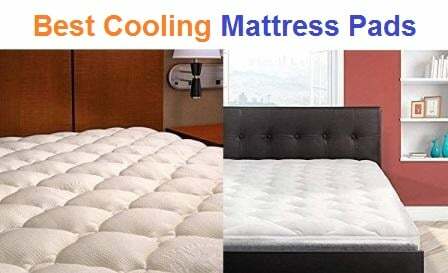 Its breathable material also helps cool mattress that retain heat. The rayon in the Bamboo blend regulated body temperature and can be found in many luxurious hotels across the USA. The fabric is breathable and counterbalances other mattresses with its cluster fiber filling which has an additional engineering process that traps air in order to allow the mattress to retain its shape. Users should pay head to the instructions that come with it and wash the pad only with cold water and use front load or high capacity washers only. It doesn’t require softeners, and has to tumble dry low. It is ideal for users who suffer from asthma. It can rejuvenate any old mattresses look. The pure polyester enhances the mattresses softness. The bottom material tend to slip. The skirt doesn’t have a strong grip. It is difficult to wash. The Advanced Sleep Solutions Mattress Topper is perfect for a comfortable night’s rest. It adds an additional level of support with its two inch gel memory foam mattress topper. The memory foam is designed to alleviate pressure, to engage the muscles while relaxing them, to contour to the spine’s curvature and to reduce motion transfer (this is particularly handy if your partner is a restless sleeper!). The cell structure is designed to include an innovative gel mixture which prevents heat buildup and provides the sleepers with a cooler sleeping experience compared to competitive products. Its medium range softness relieves pressure areas and is a strong support for the existing mattress. The gel memory foam has been created according to CertiPUR-US standards. This means that the topper is made without using ozone depleters, formaldehydes, PBDE, TDCPP or TCEP flame retardants, mercury or any other heavy metals that are prohibited. It also has low VOX emissions which improves the quality of air indoors (it has less than 0.5 parts per million). This tells us that the manufacturers care about their global footprint and have created products with low environmental impact. The product is manufacturer in the US and is certain of its products top notch quality so much so that it provides a 30 day money back guarantee as well as a three year warranty against manufacturing defects. For problems that aren’t as extreme, the customer representatives are ready with answers to any queries. Traditional toppers get flack for trapping body heat. While we all enjoy sleeping in a comfortable bed which is snug, too much heat can cause an uncomfortable sleeping experience. This is where the advanced gel technology features come in handy with their open structure design which increases breathability and reduces the heat that builds up by improving air flow and reducing the level of stiffness. The foam is uniquely blended and offers support to those with back pains and reinvigorates their muscles. It also aligns the spin through its anti-sinking design and the minimal motion transfer creates the best mood for a restful night’s sleep. It has triple layers (1.5 inch of memory foam, 1.5 inch of air flow foam and 7 inches of density support foam). Its pearl gel optimizes air flow and regulates the temperature throughout the night, increasing its coolness up to 65%. It has prolonged cooling impact. It is shipped quickly and easily. It has no chemical odors, when unpacked. It is not as plush as expected. It is difficult to get the cover back on. The Best Price Mattress Topper is a three inch memory topper that enhances the sleeping experience. Its ventilated design is ideal for air flow and reduces trapped body heat. The memory foam responds to the body and contours to its shape, aligning the spine as well as relieving it from unnecessary pressure. It is certified by Certi-Pur US for its reduced environmental impact and emission. It comes with a three year warranty. 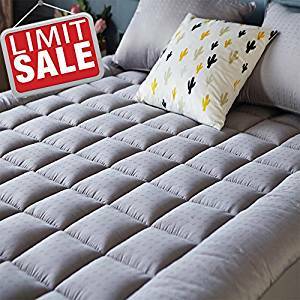 It is a one of a kind, no fuss product which provides the user with premium comfort, the best possible sleeping climate and at a reasonable price. 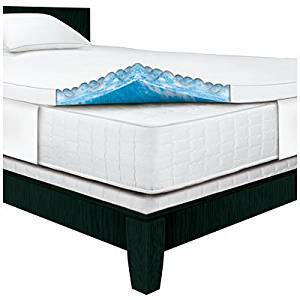 This gel infused memory foam is one of the latest advancements in providing a night of comfortable rest. One you lay your bed to the body, the memory foam adapts and responds to your body and provides pressure relief by redistributing body weight evenly. The gel beads mediate the body heat and provide a balanced and comfortable experience. The topper had been specifically designed to be an inch narrower as well as shorter than the standard size, creating a perfect blend for standard sizes sheets (this includes the topper cover). It is available in the following sizes: Twin (74 x 38 x 3), Twin XL (79 x 38 x 3), Full (74 x 53 x 3), Queen (79 x 59 x 3), King (79 x 75 x 3), and California King (84 x 72 x 3) sizes. The mattress pad weighs 29 pounds and is most suitable for people suffering from lower back pain and side sleepers. It is dual sided i.e. one side is made of dense foam, which is perfect for back sleepers while the other is memory foam which works great for both but is an even better choice for side sleepers. This is a well-rounded topper, built to last for years and is so comfortable that it provides just the right support. It has been tested through research as well. It is shipped and packaged in vinyl packaging and comes with a five year warranty. The polyester mesh cover and zipper is a welcome addition the already. It is very thick and comfortable. It has a five year warranty. It has a strong odor, but that dissipates within 48 hours. It is not gel infused. It has an excellent ventilation system. The cover is not waterproof. The Leisure Town is packaged in a vacuum bag. It needs to be washed and dried for a few days before use so that it can inflate to its original size. The best way to accomplish this is to let it lay in the sun for a few hours. It is made using HNN Cooling technology which provides a soft, plush feel and is made from 300 TC and 100% cotton. This increases its comfort and protects the skin from extra heat and sweat. While it is derivative of older models, the new shape is soft and supports the body. It has hypoallergenic and antimicrobial tendencies as it is filled with snow den alternative fill. This is a state of the art fiberfill and is authentic due to its authentic goose and duck down excluding feathers. The mattress foam is constructed such that it protects it from stains as well as from exposure to dust mites as well as other allergens. This way the user is protected from a night of sneezing and coughing. Even though the cover is made of cotton, the fluid can easily be wipe and since the mattress material is so thick, the fluid does not soak in the mattress if its less than 200 ml. This foam can fit a mattress of up to 21 inches. The topper is available in queen size (dimesions: 60” x 80”). The fabric can also stretch easily and can fit the mattress up to 21 inches. No matter how much you slide, it will remain in place. It is also easy to clean and can be washed in a machine. The manufacturer’s place a lot of importance in customer satisfaction and provide a money back guarantee in case the user is unsatisfied. The HNN Technology increases the air flow thereby making the mattress pad more comfortable and breathable. Its HNN Cooling Technology keeps the user cool without reflecting back body heat. The cotton cover and thickness act as a waterproof agent. It is machine washable, which makes it more convenient to use. The fiberfill protects the users from allergies. It does not provide value for money. The Dreamfoam bedding is made in the US and has a two inch thick memory foam topper with a gel swirl (the swirl pattern differs). The soft visco-elastic memory foam increases the comfort level as well as the user’s quality of sleep. The foam is Certi-Pur US certified and is certified on its performance, emissions and hypoallergenic properties. It has a three year warranty and is compressed and rolled so that the topper is parceled directly to the user. It takes a day for odors to dissipate and for the topper to reach its actual size. The Dreamfoam is an ideal addition to revitalize an old mattress. It comes with a soft visco-elastic memory foam which enhances the users comfort while also increasing the quality of their mattress. It adds plushness to the mattress too. The swirl topper is free of ozone depleters, PBDEs, TDCPP, TCEP flame retardants, mercury, heavy metals and other materials that are regulated by the Consumer Product Safety Commission. It has a green manufacturing process and is available in multiple sizes (randing from XL to Twin to Cali King). It is portable and compact and can even fit inside sofa beds. It has been tested for emissions i.e. research ensures that the foam is not made from any harmful chemicals. It also reduces tossing and turning and in turn improves how well a user sleeps. The four pound memory foam is extra plush and alleviates the user from back pressure as well as spine and hip pressure. The topper is medium firm and alleviates major pressure points for the spine. It is also ideal to use over mattresses that are too tight or too soft. It has minimal off-gassing; while there is a slight smell earlier, it dissipates in a few hours. It fits perfectly no matter what the size of the mattress. It retains heat, making the user sleep warm. It rips and tears overtime. Its gel name is misleading. 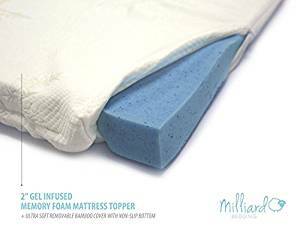 The Milliard Gel Memory Foam is made using two inch thick, 100% gel memory foam that is made to adapt to your body shape and alleviate pressure points, prevent aches and stress as well as avoid arthritis symptoms. It comes with a complimentary cover, made of silky bamboo and featuring a non-slip bottom to ensure that it remains in place. It is also removable and washable hence the user does not have to worry about keeping the topper clean. It is made of 2.5 pounds of density foam, and is of better quality than many contemporaries of the same price range as it prevents it from losing shape or becoming deflated. The unique open-cell technology and gel infused beads coalesce to regulate sleep temperatures as well as increase ventilation whilst the user rests. The CertiPUR- US certification ensures that the material is hypoallergenic and has anti-microbial qualities that reduce allergies for asthma users. Its memory foam also uses an open cell structure where each cell opens up to trap air within it. The cells becomes compressed and the air spreads and dissipates to the cells next to it, thereby lowering body temperature by increasing the airflow. The memory foam is built to contour to the users body and it is ideal to reinvigorate an old worn out mattress at an affordable price. The Milliard is ideal for quality sleep. Make an investment in your future by buying it as its gel beads are infused into the topper and the heat spreads from the body instead of collecting at the top. The cooling effect then maintains regulated temperature, suited for a good night’s rest. The mattress arrives rolled up and sealed and takes up to 96 hours to decompress. The process is quicker in warmer climates. Upon receiving the shipping, the topper may smell but that dissipates completely within a few weeks. In order to quick the process, it can be aired out and the sheets can be washed post usage. It is hypoallergenic and has antimicrobial properties. It has ideal therapeutic qualities. Its gel infused memory foam ensures maximum ventilation and air flow. Its initial odor is uncomfortable due to COV emissions but this disappear within a few weeks. This Mattress Pad Cover from Sonoro Kate has ten pounds worth of stuffing compared to other mattress pads. This increases its thickness which in turn protects the back muscles when you sleep. Even when you wake, your back will not suffer from its usual soreness. It is available in queen sized mattress size that is suitable for up to 60” x 80” in dimensions. It uses 300TC 100% cotton which makes the material breathable and plush. Along with protecting the back, it also releases the heat and is hypoallergenic and dirt proof, making it easy for the user to clean up. It has 8 -21 inch mattress that is suitable for any mattress pad, the user no longer has to worry about the height. Additionally, it is made with high elastic bands which aren’t easy to break and do not cause any slippage. The manufacturers are so sure of the product that the money can be refunded at any point i.e. this is the guarantee of a lifetime. 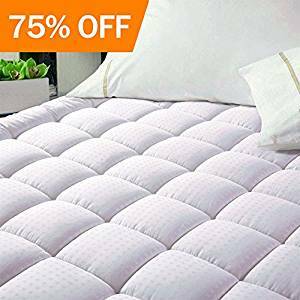 Since the mattress pad is vacuum packed during shipping, it needs to washed and placed to dry under sunlight to rid it of any dirt as well as to allow it to reach its regular level of thickness. The mattress is overfilled with loft-retaining and sixty seven pounds of high quality fabric put together through exquisite craftsmanship. It adds an extra five pounds in order to meet the optimum levels of thickness and softness. Through its hypoallergenic qualities and its breathability, skin and nose allergies are also reduced. This is because of the hypoallergenic filling along with unique poly cotton that holds the construction intact and prevents dead skin build up. This creates a more comfortable night’s sleep. The mattress is eighteen inches deep and the mattress pad is as soft as a comforter, allowing the user to sleep restfully. Its hypoallergenic quality protects the mattress from dust mites, mold spores and bacteria from entering the mattress. Memory foam mattresses are even cooler to sleep on. It is snug around the mattress and provides protection. It comes with a lifelong money back guarantee. You will need to add a waterproof fabric layer in case that is a property you are concerned with. The Zinus Sleep Master is a two inch topper which is perfect for anyone with budget constraints. It is made of Biofoam gel which creates temperature regulation and is a strong contended among other budget friendly toppers. It is CertiPUR-US certified which clears it from any toxins and has hypoallergenic qualities along with a green manufacturing process. It is available in multiple sizes from XL to Twin to Kind, and can fit inside sofa beds. Biofoam replaces traditional petroleum with natural plant oil, and also includes green tree extract as well as natural active charcoal which absorbs the moisture, gets rid of odors and keeps the mattress topper fresh. Due to the CertiPUR-US certification, users can be sure that the products meet exceptional quality standards. The topper is also among the most eco-friendly and is made without ozone depleting surfaces such as flame retardants, mercury, lead, or other heavy metals. It is also tested for emissions and is guaranteed to ensure that no harmful cancer causing chemicals were used during its manufacturing. Due to its green manufacturing, and soft plush materials, the topper has long lasting durability and excellent performance. It has a single layer of support and is ideal for mattresses that are worn out. The Zinus comes with patented technology that makes the topper easy to field and compresses it to a small size without affecting its quality in the least, unlike other toppers which get ruined when they are folded. The Biofoam goal enhances the cooling effect and the two inches of foam are idea for giving the mattress a firm feel without overdoing it. It has all the benefits of a high range mattress toppers without the price that weighs heavy on wallets. It alleviates any pain in the pressure points of the user’s body. Since the foam is only two inches thick, it is easy to cut to the size of the bed (it is advisable to choose the right size of topper as opposed to cutting it). It has a long term warranty. It is well ventilated, which makes it ideal for any sleeping position. It can be considered firm. It does not have a variety of vibrant colors. The Easeland cooling mattress is a Queen mattress pad of 60 “x 80”, with a twenty one inch deep pocket and forty nine pound elastic and hollow down alternative microfiber. The alternative filling enhances the softness of the firm mattress and its special thermoregulation ensures that the user feels no heat, keeping the mattress ventilated throughout the night. It is also made from 300TC 100% cotton that reduces noise levels and motion transfer, guaranteeing a restful night’s sleep. It is hypoallergenic and skin friendly due to its alternate fiber filling and the cotton surface absorbs sweat and makes the material breathable. Since the item is vacuum packed, it needs to be washed for the first time and then dried according to care instructions which make it more fluffy and comfortable. It is adopted to a deep pocket design that can stretch up to 21 inches with 130 grams of single track elastic fabric, and will fit the bed snugly, no matter how much toss and turn at night. 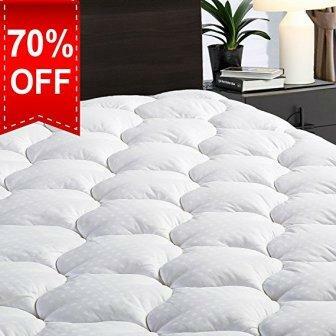 This mattress topper guarantees that you will not have to worry about a messy bed any longer. The topper is also machine washable (provided that is used under a gentle cycle) and can be placed under the sun for it to retain its fluff surface. It also comes with a money back guarantee. Sometimes, a good mattress pad is all you need to sleep your troubles away. All 49 pounds of the Easeland mattress add to the softness as well as the touch of the experience, while ensuring that the mattress is free from dust and stains. It comes in a box design which avoids the filling shifting around and retains the fluffiness; the Easeland is elegance inside and out. Its 130 grams of single track elastic fabric fit the mattress just right and the high thread count material makes the pad breathable, confirming a comfortable night’s rest. It can be tumble dry at a low temperature. It fits the mattress perfectly. The cotton inside the topper doesn’t clump. The Zinus is 1.5 inches of swirl gel memory foam that is made for ideal sleeping comfort. Its air flow pattern is made for cool support. It is made from green tea extract and castor natural plant which eliminates any odor causing bacteria. 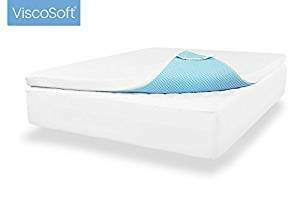 It is made from high quality memory foam which is Cetu-PUR US certifies for the content it is made of, its durability as well as its performance. The Zinus increased your mattresses comfort with its supportive and comfortable memory foam. It can fit standard or deep pocket fitted sheets. It is made of biofoam, one of the latest evolutions of memory foam and replaces traditional petroleum with natural plant oil as well as green tea extracts and natural active charcoal which helps absorb moisture and eliminates odor to keep the mattress topper fresh. The mattress topper should be opened with 72 hours of receipt and then should be allowed at least 48 hours for any odor to dissipate as well for it to return to its original size. The air flow pattern is ideal for cool support and its five-year limited warranty makes this topper a treat to use for any user. The gel memory foam is one inch while the air flow high density support foam is three inches. 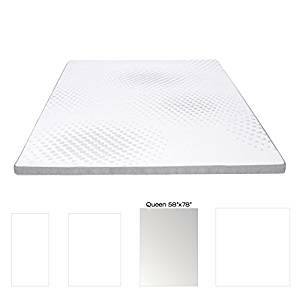 It is ideal to use with a dense foam support base in order to maintain alignment as the topper cannot resolve mattress problems. It is available in four sizes i.e. from Twin Size to King Size and also has four different levels of thickness. It helps soften a mattress but as a user you need to exercise caution and see which level of thickness suits your mattress as well as your comfort needs i.e. a four inch topper might be too soft or may make you lost your mattress support. The ideal thickness level is 2-3 inches and medium-firmness. Unlike compressed toppers, it is not shrink wrapped, hence transportation and even returns are much easier. The air flow pattern keeps the mattress well ventilated. It has a variety of thickness. It is available in limited sizes. It may not be as durable as its contemporaries. The Lucid mattress topper has a two inch memory foam which highlights five body zones in order to increase comfort. It is also infused with lavender in order to improve the scent as well as increase its breathability. The textured zones reduce the pressure on different parts of the body by in order to reduce discomfort as well as motion transfer during sleeping. 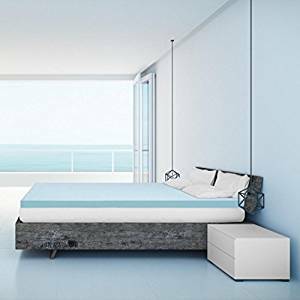 The memory foam is designed with a formula that makes it soft, airy and responsive and the queen sized mattress topper is available in 79″ x 59″ dimensions and come with a three year warranty. 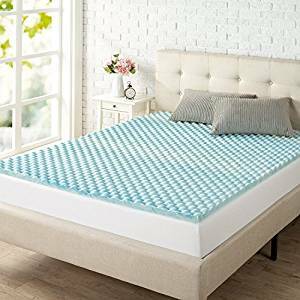 The mattress topper is designed to increase your comfort and the two inch layer softens the surface of the bed while relieving pressure of the memory foam to provide a familiar support as well as the springiness of a conventional mattress. It can also serve as a makeshift covering for a temporary sleeping surface e.g. a sofa bed or a guest bed. The five specialized body zones are designed in order to eliminate pressure points that are common, in turn improving sleep. The lavender scent works perfectly as it is naturally therapeutic and has calming properties. The memory foam also contours to the body shape and is known to distribute weight evenly by supporting the curvatures of one’s body. This also helps to decrease pressure points at the shoulders, hips, knees and feet. The shipping comes directly from the manufacturer and the product is compressed and boxed for convenient use and ease of set up. It is CertiPUR-US certifies and has been tested on several parameters to ensure safety, performance and indoor quality. Each component is carefully put together to construct a mattress topper of high quality performance. No noisome odors when the package is opened. The mattress reaches its original size within hours of opening. The mattress is subject to wear and tear if not treated with care. The lavender scent can be overpowering initially. The Serta Rest is a three inch gel memory foam topper with dimensions 60″ x 80″ x 3″. It conforms to your body and is made to alleviate pressure points through which it balances your body and also eliminates motion transfer. The mattress topper takes 72 hours to reach its full size and fit the bed, though when it does, it does so perfectly. The gel is formulated to keep the mattress cool. Its advanced sleep technology helps you sleep restfully and wake up refreshed. The memory foam is swirled with gel in order to increase comfort as well as maintain optimal sleep temperature. It has a medium-soft to medium feel and adapts to any mattress. The Serta is an inexpensive solution for someone looking to resolve their chronic back problems without depending on medicines. It is soft and plush. It contours to body shape. It takes 72 hours to reach its original shape. The Milliard is constructed with a two inch thick foam which contours to your body in order to alleviate its pressure points and prevent soreness. This relieves any back pains, muscle pains and even arthritis symptoms that the user may suffer. Along with this, it comes with a bamboo fiver cover which features a non-slip bottom that allows it to remain intact on the bed. It is removable and washable as well therefore keeping the topper clean. It has 2.5 pounds of density foam which prevents it from losing shape overtime. It is made from open-cell technology and PCM cooling gel which combine to regulate sleep temperature as well as create increase ventilation when they sleep. The CertiPUR-US is hypoallergenic and has anti-microbial qualities that prevent users from dust mites and other toxins that can be harmful for their health. The gel mattress topper is also great for comfort and support and the gel beads help dissipate heat by not collecting in the mattress. This is coupled with aerated ventilation tunnels which increases the cooling effect to maintain an even body temperature. The open cell structure traps air inside and then displaces it to adjoining cells, thereby increasing airflow and lowering body temperature. The toppers are cut an inch shorter in order to fir sheets and they are rounded to ensure maximum coverage. The Milliard also contours to the body to provide the ideal feeling of support and comfort at its most basic cost. It can take up to 24 hours to reach its maximum size, though when it does it is comfort personified. It does not trigger allergies. It may have a slight odor upon arrival.